Want to build your child’s imaginative and pretend play? Then this is the book for you!! 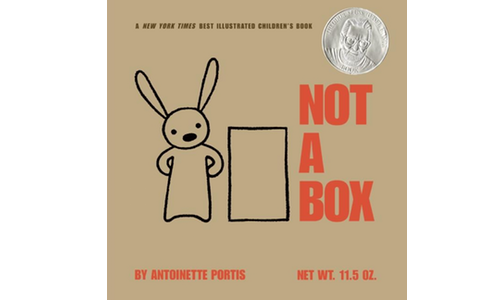 Written by Antoinette Portis an American writer who lives in California, and presented in eco-friendly brown cardboard construct, this book is a true delight. Each page presents a question (from an imaginatively challenged adult) as rabbit leads you through the landscape of his imagination. We use this book in our pre-school social group to establish a concept and then build on the idea. We have a lot of fun playing ‘It’s not a box it’s a………………..(cave, car, pram)” and “It’s not a blanket it’s a…………..(tent, parachute, swing)”. Look around your house and yard and find all the things you can use to stimulate your child’s imagination. Of course, then there is the next book…”It’s not a Stick”…..Enjoy! !